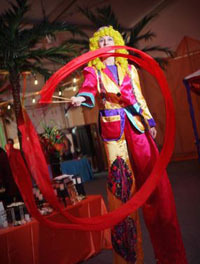 Stilt walkers are a unique entertainment option that can bring an exhilarating edge to your event. These highly trained professionals are truly larger-than-life and ready to make your party really pop. 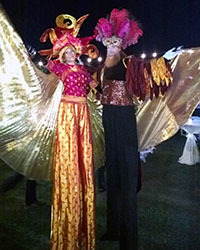 This stilt-team is an innovative and costumed pair that soars above the crowd, juggle, use ribbon sticks, mingle and add a festive air to any event or party. 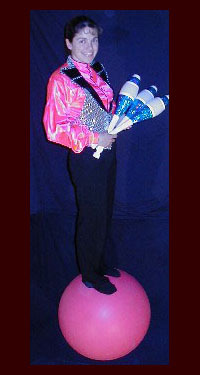 This multi-talented performer is skilled in many areas. 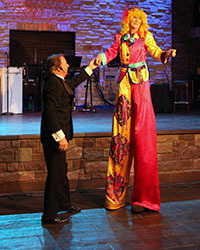 She performs on stilts, rides a unicycle, juggles and even plays with fire! Her friendly nature makes her a delight for kids and adults of all ages.